Blossoms and butterflies, buds and bows intertwined in a beautiful and colorful wreath designed by Barbara Baatz Hillman will be beautiful in any décor. Bring the springtime into your home. 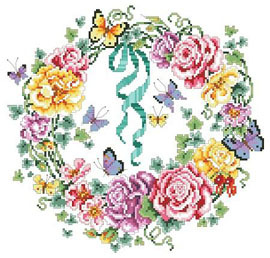 The Kooler Design Team of designers has been creating cross stitch designs for over 30 years. Contents: Stitch Count 139w X 134h Finished size on 14ct - 10" x 10"